In the 21st century, all the great powers of the world once again have acquired their own interest with their ambiguous foreign policy. 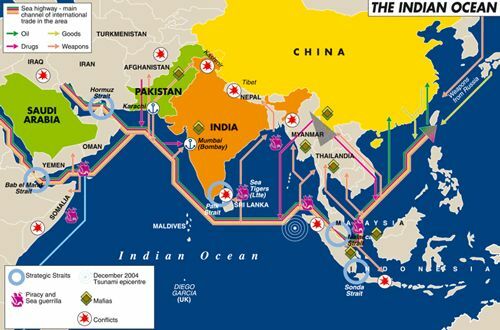 The USA, Russia, China, and India are the major powers playing their key role in the “New Great Game” in Central Asian landmass and the strategic sea lanes of the world in the Indian Ocean where 90% of the world trade is being transported everyday including oil. It is this extension of the great game race is the reason the Trump administration dropped the Massive Ordnance Air Blast (MOAB), also known as the mother of all bomb on Islamic State’s cave and tunnel systems in the Achin district of the Nangarhar Province in eastern Afghanistan on April 13 last month. While Lutz Kleveman (2003), argues that the Central Asia is increasingly becoming the most important geostrategic region for the future commodities, Michael Richardson (2004) on the other hand explains that the global economy depends on the free flow of shipping through the strategic international straits, waterways, and canals in the Indian Ocean. Two third of the global maritime trade passes through a handful of relatively narrow shipping lanes, among which five geographic “chokepoints” or narrow channels that are gateway to and from Indian ocean: (1) Strait of Hormuz (2) Bab el-Mandab Passage (3) Palk Strait (4) Malacca and Singapore Straits and (5) Sunda Strait. According to the US Energy Information Administration (EIA) report published in 2014, “world chokepoints for maritime transit of oil are a critical part of global energy security. About 63% of the world's oil production moves on maritime routes. The Strait of Hormuz and the Strait of Malacca are the world's most important strategic chokepoints by volume of oil transit” (p.1). These channels are critically important to the world trade because so much of it passes through them. For instance, half of the world’s oil production is moved by tankers through these maritime routes. Hence, the blockage of a chokepoint, even for a day, can lead to substantial increases in total energy costs and thus these chokepoints are critical part of global energy security. In a recent analysis of globalization and its impact on Central Asia and Indian Ocean region, researcher Daniel Alphonsus (2015), notes that the twists and turns of political, economic and military turbulence were significant to all great players’ grand strategies: (1) the One Belt, One Road (OBOR), China’s anticipated strategy to increase connectivity and trade between Eurasian nations, a part of which is the future Maritime Silk Road (MSR), aimed at furthering collaboration between south east Asia, Oceania and East Africa; (2) Project Mausam, India’s struggle to reconnect with its ancient trading partners along the Indian Ocean, broadly viewed as its answer to the MSR; and (3) the Indo-Pacific Economic Corridor, the USA’s effort to better connect south and south east Asian nations. India the superpower of the subcontinent, has long feared China's role in building outposts around its periphery. In a recent essay, an Indian commentator Brahma Chellaney wrote that the fusion of China's economic and military interests "risk turning Sri Lanka into India's Cuba" - a reference to how the Soviet Union courted Fidel Castro's Cuba right on the United States' doorstep. This is clearly evident how important the roles played by even the small nation states in the region vis-à-vis the New Great Game. Great powers may set the agenda, but geopolitical illustrations are depending on the game the rest of the world play, and it is, in particular, the small states that will decide the fate of their strategies to rethink the new world order. It is against this backdrop one should view why the long term strategic 1000 Kg MOAB bomb killed three birds with one stone. That is while it sent a very strong implicit message to Pyongyang at a crucial point of time, it also echoed in Moscow and Tehran, who are covertly aiding and advising Afghan Taliban, according to a Washington D.C based Middle East Institute (2017), whereas the USA has a long term strategic interest in Central Asia, particularly in the Caspian Region. Thus, it is just another post-Cold War proxy wars between the USA, Russia, China and India in multiple fronts, which is part and parcel of "The New Great Game". In its first edition The Bridge magazine's compilation of articles about "Exploring the Belt and Road Initiative" analyzes one of the single most significant transnational geopolitical initiative undertaken by a country in this first half of the 21st century and perhaps beyond. China’s Belt and Road Initiative is much more than a simple Chinese political plan to push further economic development for its own domestic consumption.